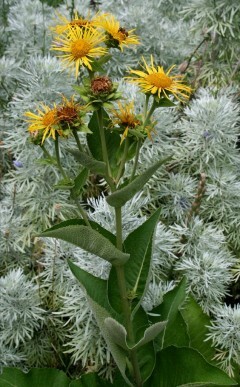 Elecampane (Inula heleniun) has very large leaves and fleshy roots. Elecampane Inula heleniun is a herbaceous perennial with very large leaves that grows from big fleshy roots. In late spring, a sturdy flower stalk grows to over 2 m with golden daisy flowers about 7 cm across. I love this plant for its exuberant, vigorous growth and big cheerful flowers. 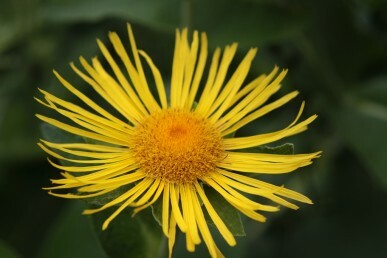 Elecampane’s early reputation was based on its being useful for ‘passions of the hucklebone’ (a modern translation might be sciatica), as well as women’s diseases and to fasten the teeth! The Ancient Romans ate the root as a vegetable and used it for seasoning, appreciating its digestive properties. Anglo-Saxons fed the whole plant to their horses as well as eating it themselves. In more recent times elecampane has been prescribed for skin diseases and shortness of breath. 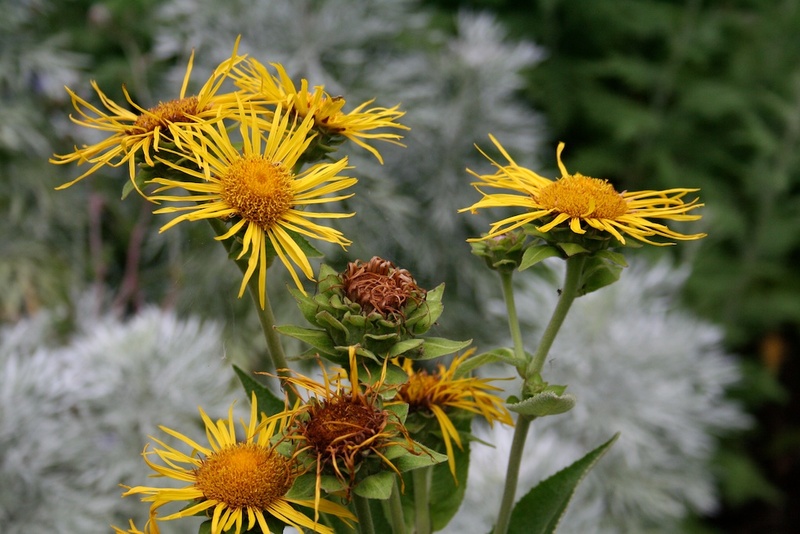 Grow elecampane from seed sown in spring or by dividing the roots in autumn, winter and early spring — use a sharp knife to slice vertically and any piece with a bud can be replanted. In the garden, space young plants about 70 cm apart and make sure they are in a position that allows for their height and vigorous growth. Cut the dead flower heads and any dead leaves back to ground level in autumn or early winter. Elecampane will tolerate most soils but the roots develop best in humus-rich, deeply dug soils with adequate water during summer. It will grow in full sun or semi-shade. When you cut back hard in late autumn, this is the best time to harvest the roots too. Cut into small pieces and then dry in the sun. 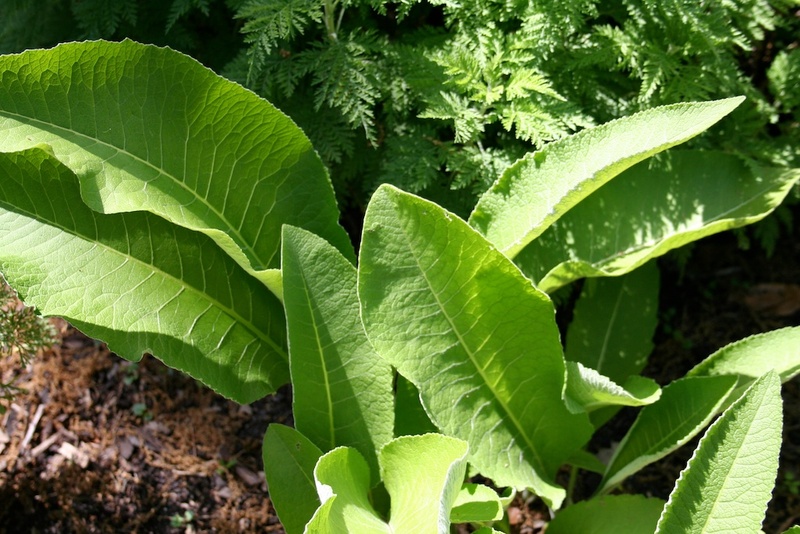 The roots have been used medicinally for centuries to treat coughs and as a general tonic. Drink a hot decoction of the roots (boil in water in a covered pan for five minutes) for hay fever, catarrh, bronchitis and any chronic respiratory condition. Use the liquid as a wash (made from the cooled decoction) for rashes, eczema and varicose ulcers.